This only works sometimes, or not at all. I recently checked the box so that I could keep track of a thread that interested me. When I lost interest I unchecked the box (being careful to save) but the emails keep coming. 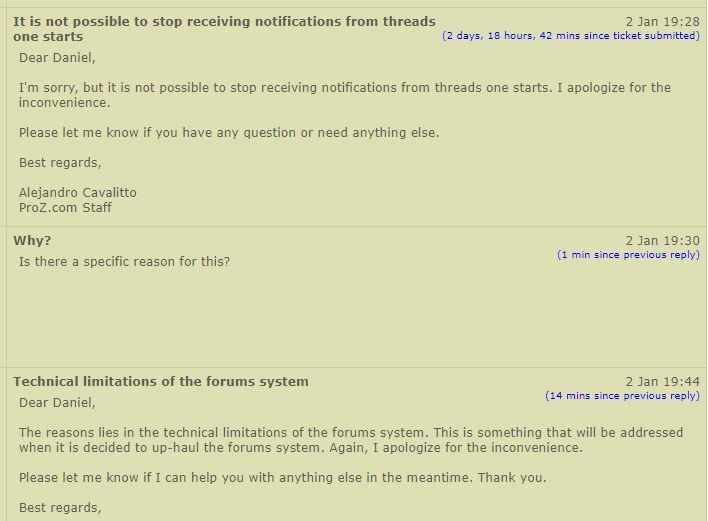 This has been happening for a very long time with a large number of different forums. My login session says that I logged on 12 days ago meanwhile I logged in today. Answer by the site staff: server delay: "ProZ.com uses multiple servers to handle user traffic and some delay is normal. " 12 days ... must be a space-time server delay. Maybe your problem is also caused by server delay. "This email has failed its domain's authentication requirements. It may be spoofed or improperly forwarded!" The un-check only works if someone else started the topic. For some unknown reason, you can't opt out from topics you started yourself. So this is something that needs to be fixed. If I start a topic I should be able to stop receiving notifications about it. Many topics go on and on and wander completely away from the original subject. The OPs will not necessarily want to keep tracking them. If I check that I want to follow a forum post, even one I've posted on, I get no email tracking messages at all. I reported it in a support request, but it seems nothing was done about it and the problem persists. All the more reason to fix it. I'm sure it would be easy to do. Do not want to read my comment here? If that really bothers you and ProZ can't/won't do anything to address the issue, then you could still create rules to move incoming mail with a specific subject (e.g. 'Reply to topic [X]') directly to "Trash" or delete it altogether. I didn't mean specifically you. Thanks for volunteering though. All right, I'll stop here, lest Tom's mailbox is flooded needlessly. ... it's too late. I read it. So my comment does not make sense now, but it was there.